Go to original pattern for design DROPS 187-17. 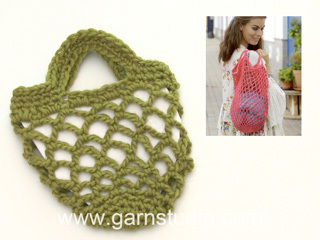 Crocheted shopping net/tote bag with chain-spaces. Piece is crocheted bottom up in DROPS Muskat. 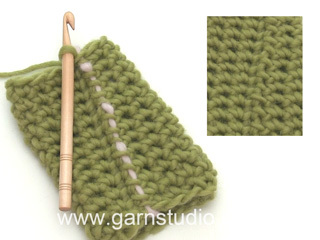 You can get the yarn to make this pattern from	4.80£. Read more. Replace first double crochet with 1 chain stitch and finish round with 1 slip stitch in 1st chain stitch. Replace first half treble crochet with 2 chain stitches and finish round with 1 slip stitch in 2nd chain stitch. 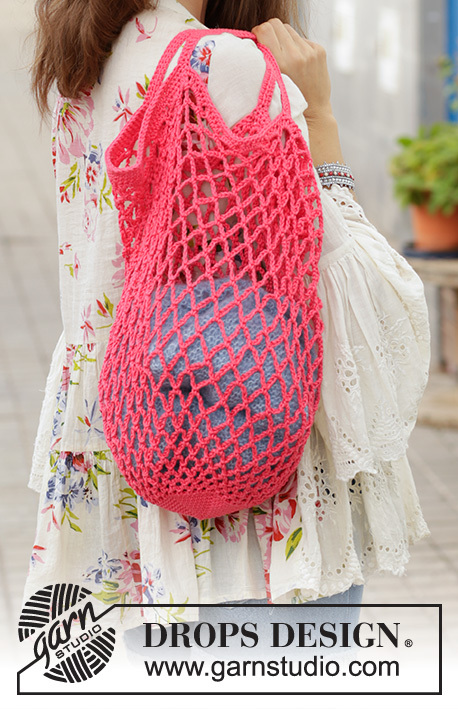 Begin shopping net with a circle with double crochets in the base, then work chain-spaces to form the net. Then work an edge with a handle in each side. Work 4 chain stitches with hook size 3.5 mm and Muskat, form a ring with 1 slip stitch in first chain stitch. 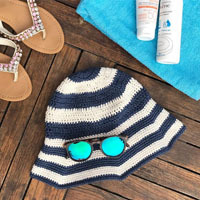 READ CROCHET INFO. ROUND 1: Work 6 double crochets in ring. ROUND 2: Work 2 double crochets in every double crochet = 12 stitches. ROUND 3: Work * 1 double crochet in first stitch, 2 double crochets in next stitch *, repeat from *-* the entire round = 18 stitches. ROUND 4: Work * 1 double crochet in each of the first 2 stitches, 2 double crochets in next stitch *, repeat from *-* the entire round = 24 stitches. ROUNDS 5-10: Continue to work and increase this way, work 1 stitch more before every increase on every round. After ROUND 10 there are 60 stitches on round and circle measures approx. 10 cm in diameter. ROUND 1: Work 2 chain stitches, * skip 1 double crochet, 1 double crochet in next stitch, 2 chain stitches *, repeat from *-* the entire round, finish with 1 slip stitch around the first 2 chain stitches on round = 30 chain-spaces. ROUND 2: Work 3 chain stitches, insert a marker in these 3 chain stitches (= 1st chain-space). This is done to make it easier to see where 1st chain-space is when continuing. Then work * 1 double crochet around next chain-space, 3 chain stitches *, repeat from *-* until 1st chain-space and finish with 1 slip stitch around this chain-space. ROUND 3: Work 4 chain stitches, move the marker to these chain stitches (= 1st chain-space). Then work * 1 double crochet around next chain-space, 4 chain stitches *, repeat from *-* until 1st chain-space and finish with 1 slip stitch around this chain-space. ROUND 4: Work 5 chain stitches, move the marker to these chain stitches (= 1st chain-space). Then work * 1 double crochet around next chain-space, 5 chain stitches *, repeat from *-* until 1st chain-space and finish with 1 slip stitch around this chain-space. ROUND 5: Work 6 chain stitches, move the marker to these chain stitches (= 1st chain-space). Then work * 1 double crochet around next chain-space, 6 chain stitches *, repeat from *-* until 1st chain-space and finish with 1 slip stitch around this chain-space. ROUND 6: Work 7 chain stitches, move the marker to these chain stitches (= 1st chain-space). Then work * 1 double crochet around next chain-space, 7 chain stitches *, repeat from *-* until 1st chain-space and finish with 1 slip stitch around this chain-space. ROUND 7: Work 8 chain stitches, move the marker to these chain stitches (= 1st chain-space). Then work * 1 double crochet around next chain-space, 8 chain stitches *, repeat from *-* until 1st chain-space and finish with 1 slip stitch around this chain-space. ROUNDS 8-16: Work as ROUND 7 (all chain-spaces have 8 chain stitches). ROUNDS 17-18: Work as ROUND 6 (all chain-spaces have 7 chain stitches). ROUNDS 19-20: Work as ROUND 5 (all chain-spaces have 6 chain stitches). ROUNDS 21-22: Work as ROUND 4 (all chain-spaces have 5 chain stitches) but finish ROUND 22 with 1 slip stitch in 1st chain stitch at beginning of round. ROUND 1: Work 5 half treble crochets around every chain-space from previous round = 150 half treble crochets. ROUND 2: Work 1 double crochet in every half treble crochet = 150 double crochets. ROUND 3: Work 1 double crochet in each of the first 25 double crochets, work 75 chain stitches (= handle), skip 25 double crochets, work 1 double crochet in each of the next 50 double crochets, work 75 chain stitches (= handle) and skip 25 double crochets, work 1 double crochet in each of the next 25 double crochets. ROUND 4: Work 1 double crochet in each of the first 25 double crochets, work 1 double crochet in each of the next 75 chain stitches, 1 double crochet in each of the next 50 double crochets, 1 double crochet in each of the next 75 chain stitches, 1 double crochet in each of the last 25 double crochets. ROUND 5: Work 1 slip stitch in each of the first 25 double crochets, 1 double crochet in each of the next 75 double crochets (= handle), 1 slip stitch in each of the next 50 double crochets, 1 double crochet in each of the next 75 double crochets (= handle), 1 slip stitch in each of the last 25 double crochets. Fasten off. Where the American English pattern says "half single crochet" - is this meant to be half double crochet? 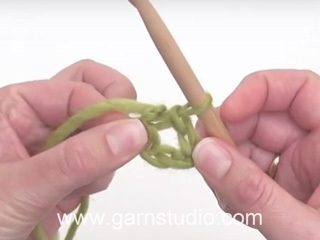 I think the video shows a half double crochet., and I can't seem to find the term "half single crochet" anywhere. I made this pattern. But the bag turned out so small! Like half the size of what it should be. Dear Suzanne, did you checked your tension? And then kept the same tension as for your swatch? Remember the hook size is always a guideline, you might have to use a smaller or a larger hook size to get the correct tension. Happy crocheting! Mijn tas is heel mooi afgewerkt, maar de handlussen zijn aan de binnenzijde wel niet zo stevig, dat rekt zo een beetje open en zou met de tijd loskomen. Kan ik dit oplossen met de handvatten aan de binnenzijde en de 25 steken tussen het handvat een extra rij vasten te geven? Of kan ik dit nog anders oplossen? De buitenzijde van de handvatten is wel steviger omdat die een extra rij kregen. Mijn tas is een heel stuk korter dan beschreven in het patroon, nl 28 cm ipv 38cm. Waarschijnlijk omdat ik de lusjes nogal vast gehaakt heb Kan ik dit oplossen door sommige rijen te herhalen, dus 2x na elkaar dezelfde toer te haken? 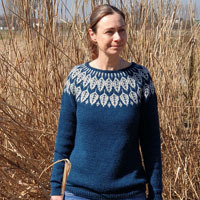 En welke toeren kan ik dan best herhalen om 10 cm meer te krijgen en toch een mooi resultaat over te houden ?Losser haken vind ik geen optie, want dan zijn de lusjes niet zo mooi. Als je de tas hoger wilt maken zou je dit kunnen doen door meer toeren van toer 7 tot 16 te haken, dus de toer waarbij alle lossenlussen 8 lossen hebben herhaal je dan een aantal keren naar wens. Bonjour, Je viens de terminer le sac filet et j'en suis très contente. Le modèle est vraiment réussi. Je suis débutante au crochet et je n'aurais pas osé le crocheter sans le tutoriel. Merci beaucoup Garnstudio ! Hi, this is a great pattern. Would I be able to use it for a not-for-profit tutorial to print out and give to the students. 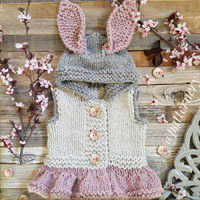 We would also provide them with Drops Muskat Yarn and a Drops Hook. Hi Petrina. 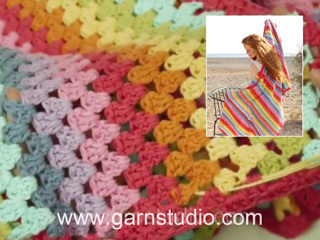 How lovely that you would like to use our pattern for this purpose. It’s perfectly fine to do so, but can you please inform the students that it is a DROPS pattern? There is a specific tutorial video for how to work the beginning of this net shoul you need it ( it can be found here ). Also, we wuld love to see the results of your class, so please feel free to share photos with out DROPS Workshop group on Facebook. Happy crocheting! Gute Idee kleine Maschen unten und erst dann groesser, sehr praktisch! Jeg har et spørsmål angående BUNNEN. Fra 5-10 omgang skal det økes slik som på fjerde omgang, og det skal økes med en maske for hver omgang. Jeg forstår ikke hvilken økning jeg skal gjøre her? Jeg har 60 masker lenge før jeg har heklet 10 omganger. Kan dere forklare hvordan jeg skal hekle fra 5-10 omgang mer detaljert? Hei ida. På 4 omgang hekler du 1 stav i de 2 første stavene og så 2 staver i den tredje (=1 stav økt). Dette gjentas ut omgangen =24 staver. På 5 omgang hekler du 1 stav i de 3 første stavene, og så 2 staver i den fjerde staven (=1 stav økt), dette gjentar du ut omgange = 30 staver. på 6 omgang hekler du 1 stav i de 4 første stavene, og så 2 staver i den femte osv. Det økes altså 6 staver på hver omgang, men for hver omgang hekler du 1 stav mer mellom hver øking. God fornøyelse. Buongiorno. Non trovo le INFORMAZIONI PER IL LAVORO. Dove sono in italiano? Inoltre mi sembra che la borsa venga molto più corta che nella fotografia. Forse sarebbe necessario lavorare più giri con gli archi di 8 catenelle, non solo dal giro 8 al 16 come indicato. Grazie per la risposta. Buongiorno Maria, abbiamo aggiunto il paragrafo mancante. Per la lunghezza della borsa, il suo campione corrispondeva a quello indicato? Buon lavoro!